The black bear is the smallest bear species and one of two bear species historically found in Oklahoma, the other being the plains grizzly, which are no longer found in Oklahoma. Although black is the predominant color of black bears in the eastern U.S., brown or “cinnamon” colored bears are common in the west. The black bear has an acute sense of hearing and smell but has relatively poor eyesight. They often stand up in order to see and smell better. Bears walk on the entire soles of their feet which accounts for their lumbering-like appearance when walking. Although bears may not look like they could move quickly, they can run at speeds of 35 mph and are excellent climbers and swimmers. The black bear is highly intelligent animal with the ability to learn quickly. Although not considered to be extremely dangerous, their behavior can be unpredictable. Black bears, however, can survive surprisingly well around humans. Weights of adults range from 200 to 600 pounds for males and 100 to 300 for females. Both male and female black bears mature at about 3 1/2 years of age and may live for 25 years. Black bears hibernate during winter but will awaken quickly if disturbed. Adult females give birth to two or three cubs every other year. Birth takes place while the female is denning. Cubs stay with their mother through the following winter before being expelled and sent to venture out on their own. Black bears use a variety of forest habitats. Being omnivores, they rely on the forests production of nuts and berries for their main diet. They will also eat insects, carrion and other available sources of meat. Because they require extensive tracts of forest, black bear populations have declined or have been eliminated in areas where land use changes have converted forest habitat to agricultural or urban developments. As human encroachment fragments forests, bear populations become patchy in their distribution. Because they’re sensitive to habitat loss, the black bear is often used by resource agencies as an indicator species to evaluate and monitor habitat quality and quantity. Where do Oklahoma’s Black Bears come from? 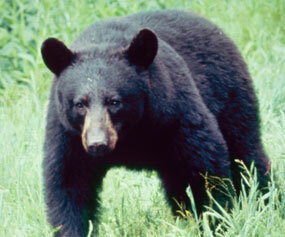 Historically, black bears ranged over all forested regions of North America. Today, in the interior regions of the U.S., they exist primarily on public lands where extensive tracts of forest can still be found. At one time bears occurred throughout Oklahoma, but by the early 1900s sightings had become rare. In late 1950s and early 1960s, the Arkansas Game and fish Commission successfully reintroduced black bears into the Ouachita and Ozark Mountains of the state. As a result of these initial releases the number of bears in Arkansas has grown from roughly 250 to nearly 2,000. Because of the increase in the Arkansas bear population, growing numbers of bears have been moving from Arkansas into eastern Oklahoma. They have also been migrating from the Ozark region of Arkansas into southwestern Missouri. Black bears are powerful animals with few natural enemies. Despite their strength, they are remarkably tolerant of humans. Interactions between bears and human are usually uneventful. In many cases, people are unaware that a bear is nearby because it quietly moves away when approached, Accounts of bears injuring humans are not common. Black bears are normally secretive animals, avoiding people. When they become bold and approach human dwellings, they are most likely hungry. The behavior is most common in late spring and early summer before most forest foods are ripe. When nuts and berries are in short supply, some bears may be quick to overcome their natural fear of people in their search for food, especially if they associate people with a food supply. When this occurs, foods should be kept away from bears and certainly they should not be fed. Usually a bear will leave the area if given time and a way out. Yelling or making loud noises will also help to alert the animal and will encourage it to leave. Bears may also come into contact with people when the young are dispersing from their mother’s range. Most of the time these bears re young males (1-1/2 to 3-1/2 years old) which have not yet established a home range. They usually move on after a couple of days. How common are nuisance bears?